As you’ve probably guessed, teaching pet sitting business owners to get more clients and make more money is kind of my sweet spot. And when it comes to turning the hobbyist pet sitters into a successful pet sitting business owner, I’m the real deal. I set up my pet sitting business back in 2001. I transformed my once teeny-tiny, itty-bitty business into a thriving a lucrative enterprise that services over a thousand clients on The Main Line of Philadelphia. Through my ultra-informative blog, videos, online courses and group coaching programs, I have empowered and taught countless other pet sitters how to turn their passion for pets into paychecks. And when I’m not turning my knowledge of the pet sitting industry into blog posts, programs or courses you will find me loving on my family, hustling on the tennis or paddle court or watching BRAVO TV! If you’ve just GOT to know more, read on. (I’ll pretend you’re Barbara Walters, and spill all my secrets. Titanic is and will always be my most favorite movie. Leonardo DiCaprio is and will always be my most favorite actor. I went to Ohio State on a field hockey scholarship. Pumpkin Spice lattes from Starbucks and Shamrock Shakes from McDonald’s are my favorite sweet treats. I love to re-watch episodes of Gilmore Girls. I actually wish I lived in Stars Hollow, Connecticut, which is the fake town where the show was shot. I didn’t start playing racquet sports until I was 33 years old, but now I’m completely hooked. It’s my favorite past time. I have been Mommy to a Rosa, a Great Dane, Joe, an English Bulldog, Doctor Watson, a Terrier Mutt and Eloise, a Shishon. They have progressively gotten smaller and smaller. I think that my husband Billy is the funniest (and sweetest) person on the planet. I am living proof that you can create a purpose-filled and lucrative business based on your love for animals and that it’s never too late to follow your heart and live your passion. Are you ready to start your journey of pet sitting business transformation? If so, complete this form to grab my info-packed eBook. 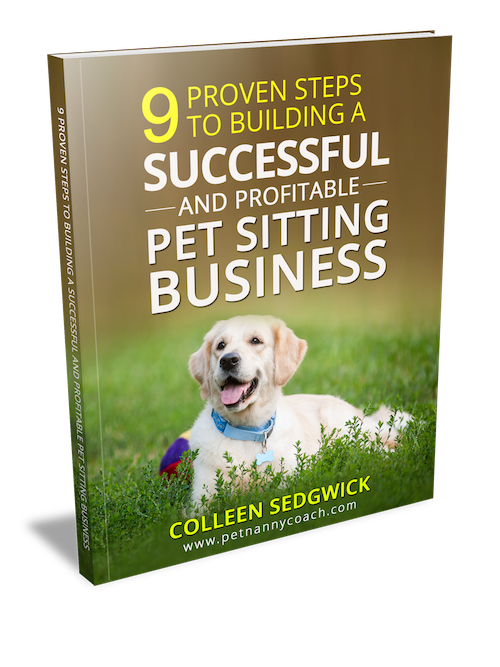 If you’re ready to make your dream of owning a successful and profitable pet sitting business a reality, DOWNLOAD your FREE blueprint now. Q. Who are your clients exactly? I mentor two types of clients. The first is “Build-Up Betty” or “Build-Up Bill.” These entrepreneurs are in the first few years of starting their business, meaning they are in the building stages of their business. They may be doing the pet sitting part-time and want to transition it into a full-time career, or they may be doing it full-time, but need to increase their revenue. Their biggest need right now is getting clients and bringing them in consistently. The second type of client is “Multiply Mary” or “Multiply Mike.” These entrepreneurs have an established business. They have clients, they’re making money, but they do everything themselves and have no time to grow their business substantially, not to mention have any time for themselves. Their biggest need right now is leverage. They need systems and practices to multiply their income and work less.